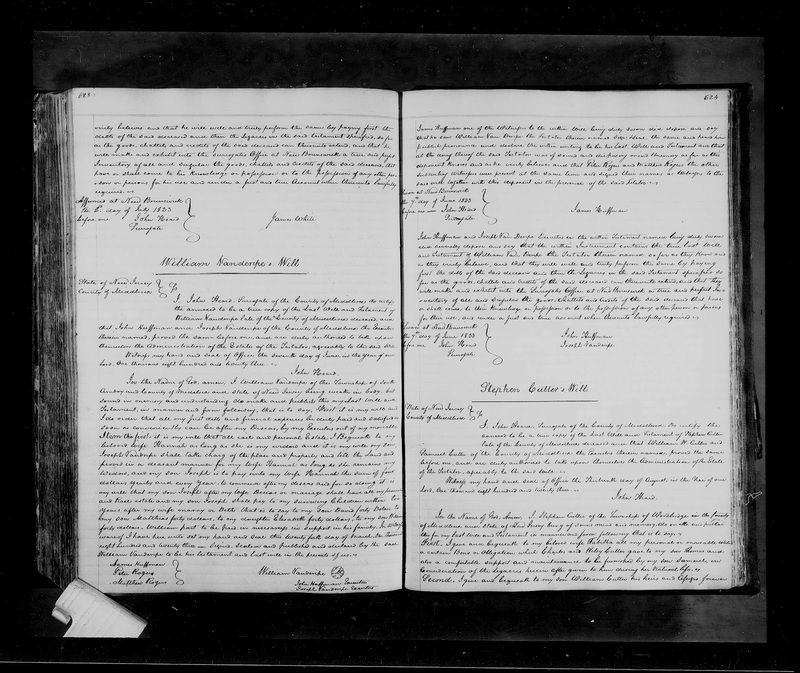 Genea-Musings: Amanuensis Monday - Post #292: 1823 Will of Stephen Cutter (1745-1823) of Woodbridge, N.J.
Amanuensis Monday - Post #292: 1823 Will of Stephen Cutter (1745-1823) of Woodbridge, N.J.
of the Testator, agreeably to the said Will. Lord, One thousand eight hundred and twenty three. this for my last Will and Testament in manner and form following that is to say. Consideration of the legacies herein after given to him during his Natural life. to pay & have paid to the full amount of his share out of my Estate. the year of our Lord, Eighteen hundred twenty three, 1823.
deponents in presence of the said Testator. by their use, and under a first and true Account when thereunto lawfully required. "New Jersey, Probate Records, 1678-1980," digital images, FamilySearch (https://familysearch.org/ : accessed 30 October 2015), Middlesex County, "Wills, 1804-1824, Vol. 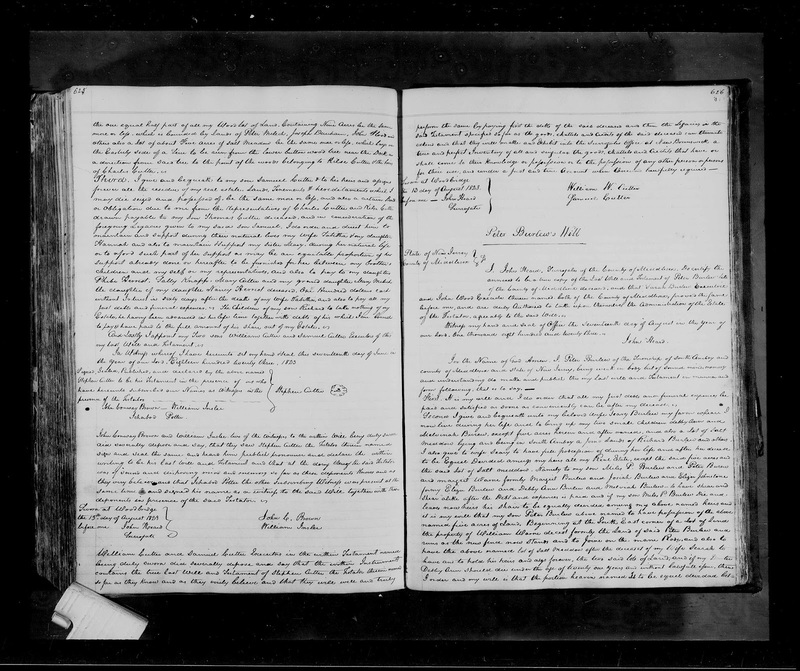 A-B," Volume B, pages 624-626 (images 605-606 of 643), will of Stephen Cutter, 1823; citing original records in Surrogate Courts, New Jersey. Stephen Cutter and his wife, Tabitha (Randolph) Cutter (1752-1841), are my 4th great-grandparents, and had eleven children. Nine of them are mentioned in the will - sons Samuel Cutter, William Cutter, deceased son Thomas Cutter, deceased son Richard Cutter, and daughters Phebe Herriott, Sally Knapp, Mary Cutter, Hannah Cutter and deceased daughter Nancy Herriot. One grandchild is named - Mary Melich, daughter of Nancy. In addition, he names his sister, Mary Cutter, and two other Cutters - Charles Cutter and Kelsy Cutter. They are not his children, they are his nephews, sons of his brother, Kelsey Cutter (1756-1798) . The Proceedings Index for Stephen Cutter, in Volume 4, Page 26, Number 5 lists only the Will entry transcribed above, and an Inventory for this estate (in the Inventory Book, Volume D, age 630). The Inventory books are not available in the FamilySearch collection for Middlesex County. Tabitha (Randolph) Cutter did not die until 1841 - I wondered if the legacies to their daughters were ever paid. I did not find a listing for Tabitha Cutter in the Estate Index 1804-1971 for A-C or C-F surnames. A search on Ancestry.com's New Jersey, Wills and Probates, 1785-1924 database did not find a Tabitha Cutter. I am descended from Sarah "Sally" (Cutter) Knapp (1785-1878), who married William Knapp (1775-1856) in about 1804, through their daughter Sarah Knapp (1818-????) who married David Auble (1817-1894). Dear Randy: Why Do You Use RootsMagic?